Procedural Writing with Edible Turkeys! 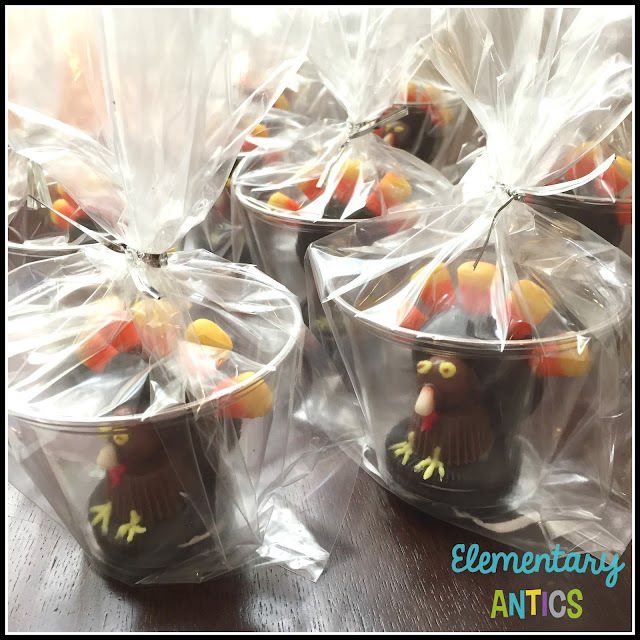 I recently made these edible turkeys with my son for his preschool class Thanksgiving party. They are so cute! It got me thinking that these would be a great to have students make for fun AND to use for procedural writing. In the past, I have always liked to use a fun food idea, that we make as a class, as a way to introduce procedural or functional writing. I've done edible pencils, spiders, cream cheese and jelly crackers, edible reindeer- you get the idea. Kids love food and the ideas are fun and relatively easy, so they can remember all of the steps needed to write about it. Sometimes I've modeled all of the writing steps while we make these things- listing ingredients, steps, etc. And other times I've simply modeled making the food while they followed along making theirs and doing all of the writing on their own. It just depended where we were in the process of learning about the writing genre. 1. Stick five candy corn in Oreo for feathers. I used chocolate frosting to ensure they were really stuck in there, but you don't have to do that. 2. Using chocolate frosting as glue, glue the 2 cookies together to make a base for the turkey body. Lay the cookies down, with the candy corn cookie on the bottom, and allow the frosting to harden and bond the cookies together for a few minutes. 3. Glue the Reeces to the base cookie with the frosting. Glue the Whopper onto the Reeces with the frosting to be the turkey's head. 4. Cut the white tip off of the last candy corn. The white part will be the turkey's beak. Using the frosting, glue the beak to the head of the turkey. 5. 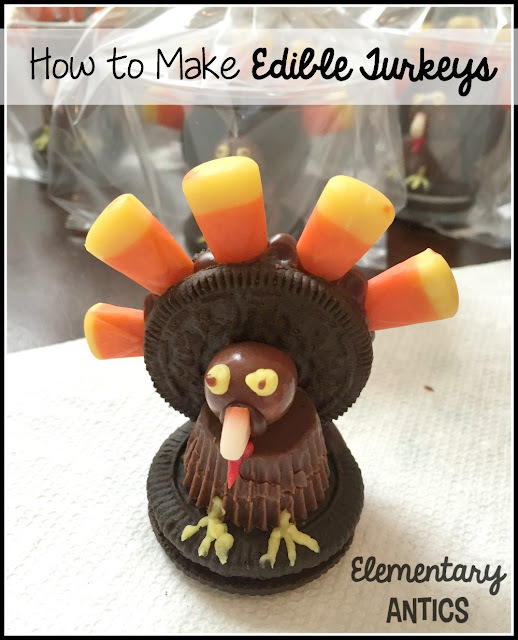 Using yellow frosting, make two turkey eyes on the Whopper. Then draw two turkey claws on the base cookie. 6. Last, using the red frosting, make a little turkey gobbler under the beak. 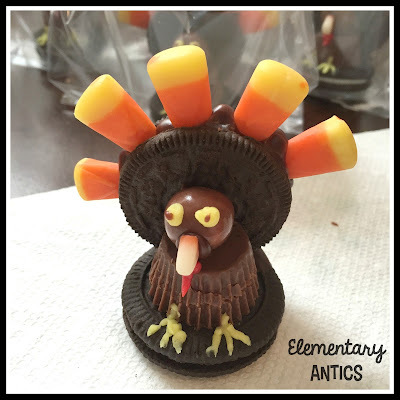 You can always just make these for a fun treat too! I just stuck each turkey into a plastic cup and into a clear plastic bag and tied them up with ribbon. Super cute for a Thanksgiving feast celebration! Such lovely edible turkeys for a thanksgiving party. I agree that kids are great fan of food and the ideas you have shared here are just amazing. Well Now I am also going to use these ideas in my twin’s birthday party at event venues Chicago. I am sure they will love my idea.